Elise Engh Studios: It's Raining Flowers! I'm up to my ears in flowers..... crochet flowers! This time I'm using my flowers to pretty-up some cardigans. I couldn't decide which flowers to put on which sweaters, so, with the help of some pins, I did a little experimenting. If you want to try your hand at making some of these yourself, you can use some patterns I used from Little Birdie Secrets. I also did a little experimenting and came up with a few patterns of my own. Stay tuned for tutorials and patterns of my own! Very nice...I love crochet flowers! If only I knew how to make them! Wow ... you are crocheting machine (so jealous of this talent ... I just end up with yarn knots with every attempt!}. Love your creations! I love these flowers... I wish I crocheted. They look great on your clothing!... my grandma made me a few with a finer thread that I use for scrapbooking. 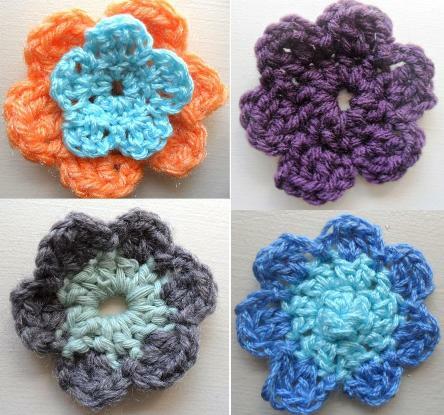 I love these crocheted flowers. The are so colorful and fun. I have been wanting to make some crocheted flowers for a while. Thanks for posting yours! They are very cute inspiration.